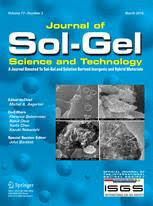 Literature highlights - September 2013 A review of recent interesting publications in the field of Sol-Gel - September 2013, by Vadim Kessler. Crystallization of structured silica An article presenting the newest fabrication methods reported by Prof. Clément Sanchez and his team (A. Carretero-Genevrier, M. Gich, L. Picas, J. Gazquez, G. L. Drisko, C. Boissiere, D. Grosso, and J. Rodriguez-Carvajal). Easy Separation of Oil and Water. An article presenting the great results obtained by Prof. Kazuki Nakanishi and his team (Gen Hayase, Dr. Kazuyoshi Kanamori, Dr. Masashi Fukuchi, Prof. Hironori Kaji).